*eg insane people, why would I ever want to travel via a method that stops every 12' and is effected by traffic? Yeah I know, 2 cooking posts in a row, who am I Kiss My Whisk? 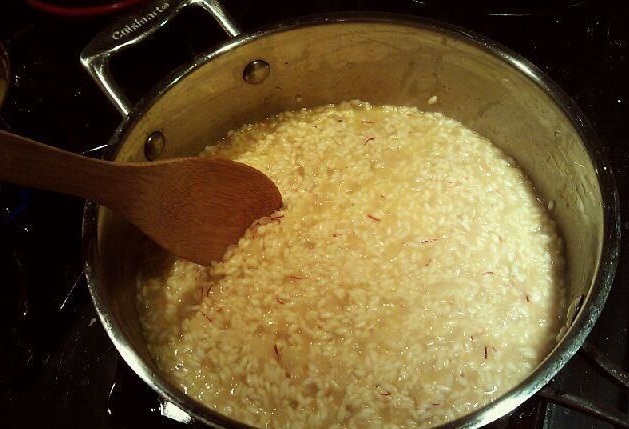 Saffron risotto is likely my favorite prepared dish (warning I have a lot of favorite foods). The problem is saffron is so flipping expensive and doesn't go very far. But- other than online bulk buying, I may have found something locally(-ish) available at Costco. Honestly I don't remember what I paid but I think it was about $15/gram which is still far cheaper than the grocery store, if they even have it. The quality was great, and the color/taste was perfect. That was enough for about 4 saffron dishes (for 2 people with leftovers). -In a large sauté pan, start sweating the onion & garlic using all of the Olive oil and butter, once they are about 1/2 of the way to the point that you'd call them fully done, add all the rice and cook until golden-yellow-brown. After adding the rice it shouldn't take more than about 2 minutes. -Now add about 1/4 of a cup of the broth while stirring slowly, add all the saffron at this point. Turn the heat down to low. -Turn the heat way down and add the last 1/2 cup very slowly, stirring constantly. -Once that is absorbed, serve and eat immediately, sprinkle the remaining cheese over the risotto after serving. Honestly other than the constant stirring its really not that hard to make, and if you can buy the saffron in bulk (or otherwise cheaper) its not that expensive either. Combine the ingredients and scoop into the lower circle on a pre-heated pie maker, spice to taste. For both of them I used crescent roll dough, one tube was able to make 8 total pies (so 16 circles, 8 top, 8 bottom). Moisten the top circle with a little bit of water, before closing the lid. I just smooshed it together and rolled it out. I'll let you read the instructions in the pie maker for the dough/pie specific ones. I'm officially adding Jon Hamm to my "hey, lets get a beer sometime" list. A large metallic ball has fallen from the heavens and landed in a remote region of Namibia, spurring a lot of speculation about its origins and spurring local authorities to get NASA and the European Space Agency on the horn. No one is sure where the hollow metallic object came from, but it definitely came down hard--it was found 60 feet away from its landing site, a hole more than a foot deep and 12 feet across. I saw this on Mental Floss and thought I'd share. Click the source link for the entire list, here's the first 4. #2 is really interesting, I had originally read about it in this book, "Spycraft" highly recommended. You’re going to need a bigger tree. The official dedication ceremony for France’s gift of the “New Colossus” was in 1886, but the idea had been in the works since 1865, when French politician Edouard Rene Lefebvre de Laboulaye decided France should do something to honor the U.S. after the Civil War. The statue was built overseas and shipped to the U.S. in pieces. If you’re leaning toward some large statuary like this for your brother from another country, you should probably warn him that he’s going to need to clear some yard space. Think your neighbor is going a little Walter White on you? Before you call the DEA, try gifting him with a bugged Great Seal of the United States. In 1945, the Young Pioneer organization of the Soviet Union presented U.S. Ambassador Averell Harriman with a Great Seal, hand-carved from wood, as a gesture of friendship. Their definition of friendship was a little dysfunctional, though, because the gift contained a bug designed by famous Russian inventor Leon Theremin. The bug was hard to detect because it was extremely thin, gave off no signal and had no power supply (this was amazing technology back in 1945, mind you). Harriman hung it in his office at the Ambassador’s House, where the “Thing,” as it was later called, went undiscovered until 1952 — three ambassadors later. The only problem with this gift is that you’ll never top yourself. Next year, you’ll have to give your demanding pal a whole state. After that she’s going to expect everything south of the Mason-Dixon line. Actually, that’s sort of what happened in the first place. We all know people with pets that are slightly left of center. Hedgehogs, ferrets, pot-bellied pigs. To really impress one of these friends, follow in the footsteps of King Manuel of Portugal and give the gift of a white elephant. The unusual present was given to Pope Leo X in 1514; Leo was so enamored with the pachyderm named Hanno that he commissioned Raphael to paint his portrait. Hopefully your animal-loving friend is a more responsible pet owner than Leo was. Believing that gold was the answer to everything, Leo supposedly had Hanno’s handlers feed him laxatives laced with gold when he got a little constipated. The gold proved too rich for poor Hanno, and he died at the young age of six. by making this for somebody else. In a research paper called "The population of natural Earth satellites", astronomers say that Earth has a second moon at any given time. While these moons are small, the scientific implications of this discovery are phenomenal. Back in 2006, the Catalina Sky Survey in Arizona noticed that a mysterious body had begun orbiting the Earth. This object had a spectrum that was remarkably similar to the titanium white paint used on Saturn V rocket stages and, indeed, a number of rocket stages are known to orbit the Sun close to Earth. But this was not an object of ours. Instead, 2006 RH120, as it became known, turned out to be a tiny asteroid just a few metres across--a natural satellite like the Moon. It was captured by Earth's gravity in September 2006 and orbited us until June 2007 when it wandered off into the Solar System in search of a more interesting neighbour. 2006 RH120 was the first reliably documented example of a temporary moon. but you have the temperature for it (and you have a power washer). Short version, you combine a power washer and an air compressor, let that mofo fly in a cold back yard and enjoy! (click the source link for the actual instructions). A team of geologists from Britain have pinpointed the exact quarry that Stonehenge’s innermost circle of rocks came from. It’s the first time that a precise source has been found for any of the stones at the prehistoric monument. Robert Ixer of the University of Leicester and Richard Bevins of the National Museum of Wales painstakingly identified samples from various rock outcrops in Pembrokeshire, Wales. For nine months the pair used petrography — the study of mineral content and textural relationships within rocks — to find the origins of Stonehenge’s rhyolite debitage stones. These spotted dolerites or bluestones form the inner circle and inner horseshoe of the site. They found the culprit on a 65-metre-long outcropping called Craig Rhos-y-Felin, near Pont Saeson in north Pembrokeshire. 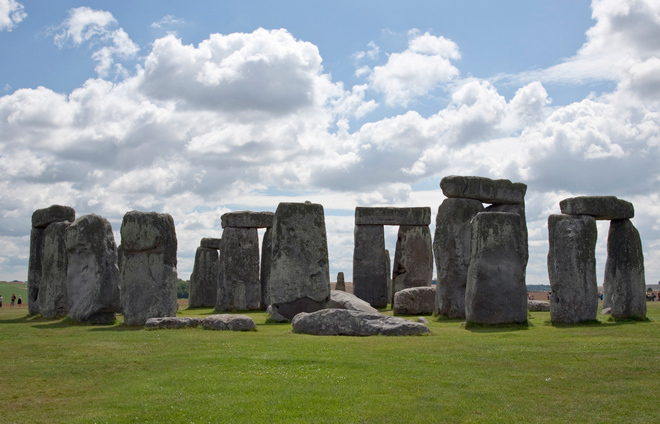 It lies approximately 160 miles from the Stonehenge site. Having said all that, how the F*** did these people get these rocks from point A to point B over 5,000 years ago using a method that we haven't been able to definitively figure out 5,000 years later. I know how defeatist that sounds and I'm not proud of that attitude either but... prove me wrong, please? Ab Fab is back! for 3 specials, the first airing on Christmas day (in the UK, no idea US broadcast times/dates). One of my favorite songs from one of my favorite bands. The opening chord of the Beatles song "A Hard Day's Night" has always been a bit elusive as to what it actually was. CBCRadio host Randy Bachman, visited Abbey Road Studios where they've got all of the Beatles' master tapes converted to digital, [truncated] Bachman listened to each of the tracks played back one at a time to reveal the underlying root chord played by George Harrison. In keeping with this webpage being random as hell, now a science post! MIT researchers have created a new imaging system that can acquire visual data at a rate of one trillion exposures per second. 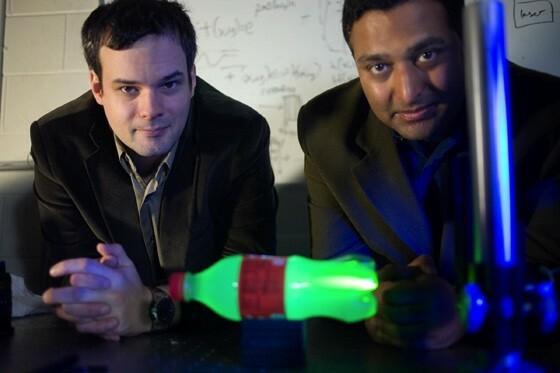 That’s fast enough to produce a slow-motion video of a burst of light traveling the length of a one-liter bottle, bouncing off the cap and reflecting back to the bottle’s bottom. Media Lab postdoc Andreas Velten, one of the system’s developers, calls it the “ultimate” in slow motion: “There’s nothing in the universe that looks fast to this camera,” he says. Particles of light — photons — enter the camera through the slit and are converted into electrons, which pass through an electric field that deflects them in a direction perpendicular to the slit. Because the electric field is changing very rapidly, it deflects the electrons corresponding to late-arriving photons more than it does those corresponding to early arriving ones. The image produced by the camera is two-dimensional, but only one of the dimensions — the one corresponding to the direction of the slit — is spatial. The other dimension, corresponding to the degree of deflection, is time. The image thus represents the time of arrival of photons passing through a one-dimensional slice of space. "B*tches LOVE high speed cameras!" 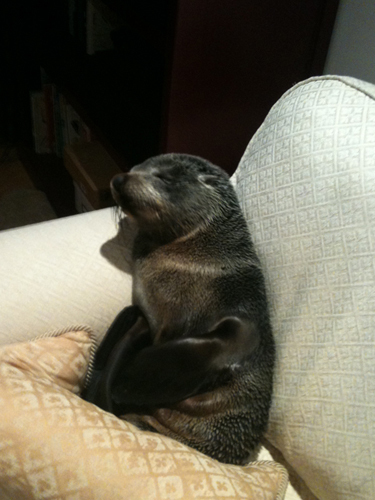 A wandering baby fur-seal wriggled through the cat-door of a Bay of Plenty house - and made himself at home on the couch. A stunned Annette Swoffer thought she must have been hallucinating when she found the young pup hanging out with her cats in her kitchen on Sunday night. Ms Swoffer called the SPCA. 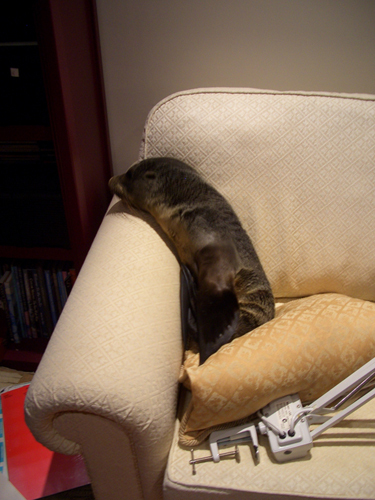 "They were giggling away and I'm saying 'I'm not drunk, I'm not lying', there's a seal in my house." The SPCA contacted the Department of Conservation, which was already looking for a seal reported hopping along Welcome Bay Rd. Ms Swoffer said the pup was "really friendly" and not aggressive in the slightest - which is unusual for seals. Click the source link below for the rest of the pictures. Just heard this guy (Gary Gulman) on "Preston and Steve" this morning. It was one of the best radio interviews I've heard in a while. Too bad he seems to re-use material a lot. "Because we can't legally call it an education"
Make sure to stock your bunkers. I'm a girl! tee hee! So that means you should go down to your local mall and dance with an iPod right?! I really think Bob Sacamano needs a bigger representation here... I mean, he can get these Russian hats down by battery park whose difference is negligible from Sable, $40.